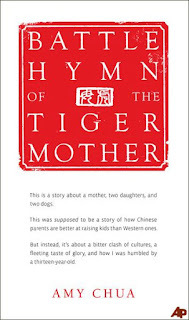 Published in 2013, Tiger Babies Strike Back: How I Was Raised by a Tiger Mom but Could Not Be Turned to the Dark Side by Kim Wong Keltner is a response to the controversial 2011 book, Battle Hymn of the Tiger Mother by Amy Chua. I haven't read Amy Chua's book, but I've read a great deal about it, and I've also consulted Wikipedia to better understand it. In Battle Hymn of the Tiger Mother, the author describes her efforts to give her children what she calls a traditional, strict “Chinese” upbringing. In the book, she uses the term "Tiger Mother" to mean a mother of any ethnicity who's a strict disciplinarian. According to Wikipedia, Amy Chua has stated that her book is a self-mocking memoir, rather than a manual for parents. "I'm teaching Lucy the subtleties of listening to her own body, and her own heart." Kim Wong Keltner dedicates this memoir to her daughter, Lucy. The author sounds like a wonderful, loving mother who wants the best for her daughter and cares deeply about her child's emotional health. 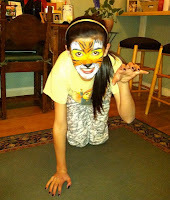 In Tiger Babies Strike Back, she describes the playdates and the messes and the chaos, and she realizes the great flexibility that moms need to develop. She strives to be the best mother to her daughter, and I'm certain that she succeeds. Remembering how difficult, emotionally unavailable, and overly competitive her family was, the author is determined to give her own daughter a different type of life, which nurtures creativity and cooperation, and fosters a healthy sense of self not bound insufferably to achievement. I understand and respect this. While I enjoyed reading Tiger Babies, I wanted to like this book even more than I did. The concept is clever, the title is clever, and many of the lines are clever, but I had some issues with the book. Although it's humorous, I'm not sure if the overall tone of this book is self-mocking in the same way as Amy Chua's book. After reading Tiger Babies for a while, it became repetitive and somewhat tedious to me, although I enjoyed the last few chapters very much, which brought back memories of when my own children were younger. I realize that the author would have preferred a warmer upbringing, but I felt as if she harped on that. I agree that we should nurture our children, to show them affection and hug them. But, I also believe that we need to push our kids a bit--they are strong and resilient--to help them reach their potentials, as students and as people. I do think that many parents are too permissive, and that overindulging children harms them. 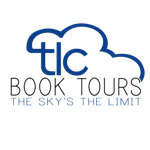 Loving our children means thinking about their future as well as the present. I don't mean to sound as harsh and critical of this book as a "Tiger Mom". I read an uncorrected proof of the book, and it's possible that had I read a final version of this memoir, I'd have enjoyed it more. I do think Kim Wong Keltner is a talented writer, and I'd like to read other books by her. The Dim Sum of All Things and Buddha Baby appeal to me. The titles of her books are terrific, don't you think so? Special thanks to Trish from TLC for sending me an advance copy of this book. For additional reviews, please visit the other stops on TLC's book tour of Tiger Babies Strike Back. Suko: I enjoyed your comments and reactions to the book. It seems to me that Kim Wong Keltner's experiences with her Tiger Mom has made her very insistent and has made her feel very strongly about her upbringing. I don't think all Tiger Moms are alike and I certainly didn't have one. 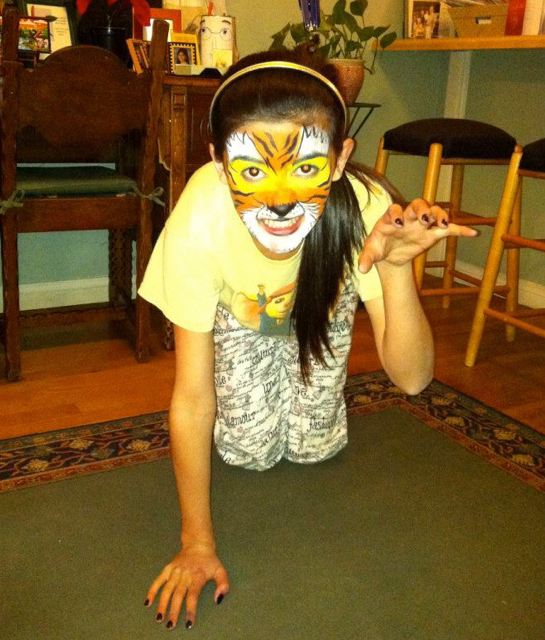 I had a Tiger Dad, who did not, however, demand that I become a famous person, being female, etc. I do know of at least one other Chinese/Asian writer who was so traumatized by her childhood that she has refused to have children of her own. Suko, I'm with you- overindulgence isn't good, and I see a lot of it these days. I'm always happy to find another mother with similar ideas. I'm not Asian, but I think these insights into parenting and ethnicity are interesting. Thanks for sharing! Great review Suko. I agree with a balance of both nurturing and encouraging children in order to help them reach their potential. Is that your young one? Too cute!! Thanks, Naida! The pic is of my youngest, taken a few years ago. I enjoyed the Tiger Mom on audio and this sounds like one I'd like to try as well. Parenting is not an exact science, and I think there is merit to both type of parenting. I love the titles of her books!!! They are so creative and clever :) Thanks for sharing your honest thoughts on this one. It was nice to hear what you liked and what didn't work for you!!! I agree that parenting isn't one of the easiest jobs in the world. Having been the mother of five children, and five different personalities, what worked for one, may not have worked for the others. It is a job I would not want to repeat, but enjoyed that time in my life. I'm now a great-grandmother of seven, so my raising children days are long behind me. I enjoyed your review, and the pros and cons of this book. Oh dear, a shame this became tedious reading, I think self-mocking is so hard to get right in any book. Thanks for your interesting review. The titles of the books are interesting. The picture of your daughter is great! Sounds like your view of parenting is well balanced Suko. I had no idea that Cha described her book as self mocking. It seems that so many people are oblivious to irony these days. I agree, the titles of her books are fantastic! That title is really interesting! It is sad that it was so tedious to read though! Only parts of it were tedious. I enjoyed most of it. Thanks for stopping by! Great review! I agree with a lot of what you said about how the book became repetitive after a point. Great title! I loved your well balanced review. I always enjoy reading parenting books as well to get different perspectives on raising children. It is definitely not an exact science. I agree with you though that having a loving home is important, but it is also not bad to try to push your children toward achievement as well. Thanks so much for sharing your thoughts on this book for the tour! You did a great job with the review! I agree with you Suko and with Hearthertic just above . To be a parent is such a difficult job ! But be too permissive is never the solution. I bought Tiger Mom for my mother because she's (always been one?) always loved the idea. I haven't read it myself, though, because I was afraid it would make my emotions over parenting even more conflicted. Was I too strict? Too lenient? Did I do everything okay even though I can't go back and change it, and I tried my best? You get the general idea. So, it's interesting to know that the 'response' for the book fell a little flat for you. I can certainly see why. I did read Tiger Mother and thought that some of the concepts that Chua espoused are things that many children these days could use. I do agree though that sometimes they can be pushed too hard and nurturing compassion would work better. Without having read Keltner's response to the book, I suspect that there's a balance between the two ways of raising children that incorporates the best of both worlds into raising confident, resilient, and motivated children. Kristen, thank you for stopping by, and for your eloquent contribution to this discussion.